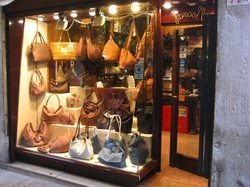 Luxurious Italian leather handbags, handmade in the Venice. The shops listed here are emerging designer and artisan shops that sell handmade leather goods, gloves and handbags. Here you'll find products whose quality is on par with the most famous Italian handbag companies and products are designed and produced in the Veneto using fine Italian leather. Each design is unique to these producers and their shops. Pure Veneto area luxury leather goods. DECLARE, opened by one of the former owners of Officine 904, features an exclusive line of leather handbags entirely made in the Veneto, but already appreciated in several other European cities. They come in a wild array of colors, yet the styles are classic, elegant and functional and the prices are very reasonable for the quality of goods on sale here. Look for unique understated features such as their discreet clutch handles and inscribed findings. Fanny: Gloves and Accessories in two locations: In San Polo on Calle Dei Saoneri between Campo San Polo and Campo San Toma & In Cannaregio on Rio Tera San Leonardo. Fanny offers delicious leather goods that smell as good as they look! All of the handbags at Fanny are handmade by a group of artisans based in Padova. They have a select number of styles and colors available in their two Venice shops, but can also make handbags to order and will happily ship them to you as well. Fanny also offers a wide selections of both women's and men's leather gloves made in Naples and has a selection of unisex bags and briefcases. 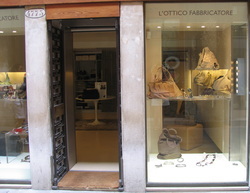 L'Ottico Fabricatore, 4773 San Marco, On Calle del Lovo. L'Ottico Fabricatore, originally an eyeglass workshop, is now a boutique selling original Francesco Lincetto designs in everything from eyeglasses to handbags, jewelry and glass works. All pieces are flawlessly executed in high quality materials and are exceedingly luxurious. This shop was featured in the Financial Times Magazine "How to Spend It" in 2009. Francis Model Borsette in Esclusiva, 773/A San Polo, On Ruga Vecchia San Giovanni, Near Rialto. There are lots of leather goods for sale in Venice, some are by non-Venetian Italian designers and some come from countries far away, but very few are as high quality as the purses and briefcases at Francis Model Borsette in Esclusiva. This shop is a father and son operation selling unique pieces all designed and handmade in Venice. If you've been dreaming of going home with sumptuous Italian leather handbag, don't miss this shop! Lauretta Vistosi, 2866 Dorsoduro, Calle Lunga San Barnaba. More in the market for a vegan bag? 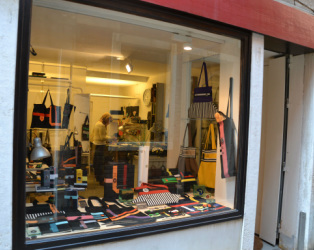 Lauretta Vistosi designs, hand-makes and sells fun, funky and original fabric and cloth handbags in her small shop in Dorsoduro. Pieces are versatile and span a range of colors and sizes from boating bags down to cellphone cases. Many of the pieces also incorporate Murano glass from the studio of Piero Ragazzi. Raggio Veneziano, 2953 San Marco, In Campo Santo Stefano. 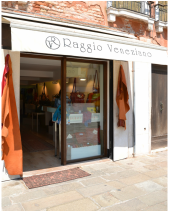 Raggio Veneziano sells original Italian leather handbags and wallets. Many of the items for sale are sewn here in the shop and all others are locally produced. The shapes and designs are bright and modern. Many include pieces of Murano glass fashioned as clasps and zipper pulls. The styles and materials vary from classic to modern but all have a definite flare. Some of the edgier pieces included a women's work-tote with a detachable iPad case.